You may have already seen this on your TV -- this ad has been airing around the Treasure Valley since last week. Check out Byron's blog and don't forget to get out there and vote on Tuesday! We've got some outstanding Democrats running here in Canyon County, lets hope we can get them all elected! My opponent apparently finally realized that the election didn’t end in May. He’s been a no-show all summer – his website and blog still encourage people to vote in the primary, and I never saw him at Meridian Dairy Days or Kuna Days and other events, and he didn’t respond to the Statesman’s questionnaire in July. However, the Statesman did their endorsement interviews last week, and he deigned to show up for those, and the Statesman let him respond to their questionnaire at that point. I’d been concerned that he had the opportunity to see my answers before formulating his own, but it doesn’t seem like I have to worry. Well, I’m certainly not going to deny that it’s a problem. As the mother of a child in school, I’m not trying to insist on people’s rights to drop out. But this brings up a lot of questions. •	Just how would he propose making it mandatory? •	How would he force the people to come to school? •	How long would it take? Will we have disgruntled people in their 20s lurking around the high schools because they’re forced to be there? •	Would it result in people getting diplomas they hadn’t earned, diluting the value of an Idaho high school diploma? •	One of Tom Luna’s reasons for asking the Legislature for a high-priced longitudinal data system is to help track high school graduation rates better. Shouldn’t we find out the true scope of the problem first? •	Based on current data, Idaho actually has a pretty good graduation rate compared to other states. Where we fall down is getting our children beyond high school to college. •	The flawed federal No Child Left Behind system is essentially predicated on cutting loose the children who don’t perform, or running the risk of having a school labeled as “failing to meet adequate yearly progress.” What will happen to Idaho schools’ ranking when they are forced to keep these students around? But the biggest problem is that he prefers to just slap a law on something rather than finding out the cause of a problem. What is making the kids drop out in the first place? Let’s determine that, and address *those* issues, perhaps by providing other options for letting Idahoans earn high-school diplomas. And this is a guy who wants to be on the Education Committee! Please. Tell your friends in District 21. If you can contribute time or money, please let me know. Write letters to the editor, in both the Statesman and the Press Tribune. This is Bill Sali’s old seat, and this guy’s ideas are in Sali's fine tradition of repealing the law of gravity and “abortions cause breast cancer.” Southern Ada County deserves better. 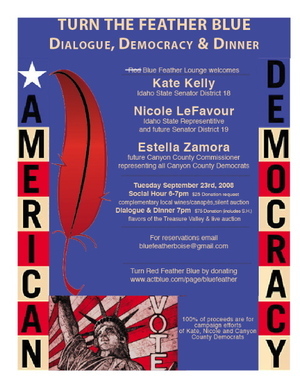 Tuesday, September 23 - "Turn the Feather Blue" is a fundraiser for state Senator Kate Kelly, future state Senator (and current Rep.) Nicole LeFavour, and the Canyon County Democrats (represented by future Canyon County Commissioner Estella Zamora). Enjoy great local food and fine beverages at the Red Feather Lounge in downtown Boise. Tickets are $25 for happy hour or $75 for a full six-course meal hosted by the Red Feather's Dave Krick. Get more info here and sign up here. Sunday, September 28 - Several downtown Boise businesses are teaming up for an afternoon of music and fun to help elect officials who will safeguard our clean air, water, quality of life, and natural places. Conservation Voters for Idaho board member & Record Exchange owner Michael Bunnell and CVI Executive Director Lee Flinn are hosting the party with free hors d’oeuvres and drinks, friends, and music, plus a silent auction featuring a Nirve Paul Frank Cruiser bike and other great items. Tim Johnstone of KRVB 94.9 The River will emcee, and Idaho Mountain Touring and the Boise Co-op are helping out, too. All proceeds from the auction and from the sale of the Record Exchange’s 3’ x 3’ mounted rock posters will go to Conservation Voters for Idaho Action Fund. The fun runs from 2 to 6 p.m. No RSVP's needed; just come to the RX at 11th and Idaho and have fun. Friday, October 10 - Internationally known Boise-based musician Curtis Stigers will give a rare solo acoustic performance to benefit the Ada County Democrats' Get Out the Vote effort. The "Concert for A Change" is set for 8 p.m. at the Egyptian Theater in Boise. Tickets are $30; order 'em online here or get 'em at the Record Exchange, the Boise Co-op, or the Egyptian Box Office. This is an open thread. I'm going to spend my weekend walking in the Women's Fitness Challenge (Go, Team Obama! ), watching the Broncos battle the Ducks, and planting Team 17 yard signs all over my precinct. What are you doing? Branden Durst, Brett Adler, Brian Cronin, Chris, Chryssa Rich, Dean Ferguson, Debbie Holmes, Deborah Silver, Don Rosebrock, Elizabeth Wasson, Jessica Cavalieri, Jim Hansen, John Foster, Kurt Holzer, Lane Startin, Larry Grant, Larry LaRocco, Linda Langness, Ryan Hill, Sara E. Anderson, Serephin, Sheryl Dowlin, Steven Mercado, Tara Rowe, The Nickel-Plated JA, theresa reel, T.J. Thomson, and William Thomas. Paul Woods and David Langhorst invite you to stop by Campaign Headquarters this Thursday evening for a few minutes to check out the digs and chat with David and Paul, as well as several of your local Democratic legislative candidates. We'll have food and drink and the opportunity for you to get to know your candidates and their vision for our County and State. For more information, please e-mail Ryan Hill or call 853-0307. Voter #17 at 2:35 p.m. Turnout for today's Boise school board election is super-low. I voted about an hour ago at my neighborhood school (Hawthorne), and I was only the 17th voter in more than six hours. Ouch. But what do they expect when they hold an election with almost no publicity, the day after a three-day holiday weekend? Polls are open until 8 p.m. Get a list of locations here, and read the candidates' positions here. I cast my ballot for Jeff Almeida and Nancy Gregory. Update 10:15 p.m.: The incumbents (Nancy Gregory and Janet Orndorff) won. Sorry, Jeff. And sorry, Boise. Turnout was an abysmal 1.19%, with fewer than 1,200 voters casting ballots. More here. Happy Labor Day, everyone. I hope you had a great weekend. I stopped by the Boise Central Trades and Labor Council's annual shindig at Municipal Park, where hundreds of people were enjoying burgers and dogs hot off the grill and plenty of fine speechifying by our Democratic candidates. Before the speeches, I introduced myself to some folks at my table and mentioned that I write for a Democratic blog. One woman asked, somewhat in a panic, if it was a "Democrat" picnic. I said no, but that most union people lean Democratic, and that Democrats work hard for working families. Come to think of it, when was the last time you saw Mike Simpson, Bill Sali, Mike Crapo, or Jim Risch at this event? So yeah, it is a Democratic picnic in spirit, if not in fact. Larry LaRocco, who has been Working for Senate since last summer, led off the speeches. ("I can't thank you enough for what you've done for working families across Idaho," labor leader John Kierce said as he introduced Larry.) "This is not a time to conceptualize or theorize or visualize about winning," Larry said. "This is a time to put our shoulder to the wheel and win." He blasted the John McCain-Jim Risch health care plan, saying he could describe it in three words: "Don't get sick." He also reminded the crowd that, as a Congressman in the 1990s, he voted against Bill Clinton's wishes and voted against NAFTA. He pledged to continue working jobs alongside Idahoans - he's done 34 so far - even after he's elected as a means of staying grounded in what working families experience every day. Walt Minnick was next, and the 1st District House candidate said that America is not great because of its Wall Street millionaires or celebrities or star athletes, but because of its working people, adding that "if this country has a future - and it does have a future," it's because working men and women will work to turn around the crises of foreclosed homes, outsourced jobs, and health care and education that's beyond the reach of most middle-class Americans. "Fortunately, we're not the only ones to recognize this mess, he added. "The consensus is that Washington, D.C., is broken and that it's time to fix it. Debbie Holmes, the 2nd District House candidate, pledged to focus on clean energy jobs, conservation, and honoring our veterans "with real help, not just lip service." She mentioned that as a former Hillary Clinton supporter who became a Barack Obama last March, she was insulted by John McCain's pick of Sarah Palin as his running-mate, adding "Sarah Palin isn't ready to lead this country, and John McCain isn't either. He's proven it with his choice." She concluded her remarks by asking people to "show America that Idaho wants to be part of the change." Update: McJoan had a write-up and photos at Daily Kos, too. "Yes, Idaho still has Labor, though two decades of 'right to work' has lessened their ranks. Nonetheless, they're still active, vocal, and fighting for Idaho Dems." Read and see more here. Here are some photos from the Ada County Democrats' DNC watch party Thursday night at the Basque Center in downtown Boise. Thanks to all the sponsors, organizers, and volunteers who made this such a great success. Update: Here's KTVB coverage of the event, as well as a story about the watch party in Pocatello. Boise is used to hearing of fires burning distant forests and rangelands. But Monday evening, the fires came to southeast Boise, as a wind-whipped grass blaze of still-unknown origin destroyed nine homes, damaged 10 others, and forced the evacuation of a nearby subdivision. Reports last night indicated there were no deaths and no serious injuries, but just now, Boise Police are reporting that one person died. Here's coverage from last night from the Idaho Statesman and the Associated Press. Our thoughts and prayers go out to the victim's family and friends and to everyone displaced by the fires, and appreciation is due the first responders and neighbors who kept the fires from spreading further in this heavily populated area.